A new arena rights deal between Scotiabank and Maple Leaf Sports & Entertainment, worth a reported $800 million, will see Toronto's Air Canada Centre get a new name. For Scotiabank, the attraction was simple. In a country where hockey is king, having your name up in lights on the home of the Maple Leafs is where you want to be. Especially when the building also houses the Toronto Raptors, has a prime downtown location and is a primo concert venue. As a result, the Air Canada Centre is becoming Scotiabank Arena next July when a 20-year agreement between Maple Leaf Sports & Entertainment and Scotiabank kicks in. "The reality is hockey is super-important to us," Scotiabank's chief marketing officer John Doig said in an interview. "Over the past 10 years, we've invested a lot of time and effort becoming relevant to consumers who like hockey and are engaged in hockey whether it be at the NHL level all the way down to the grassroots level across the country." Doig says the naming rights package, when compared to other arena agreements given what they are worth today factoring in escalators, "probably puts our deal second or third on the (North American) list." David Hopkinson, MLSE's chief commercial officer, called the deal "record-setting." Air Canada was interested in retaining the naming rights but the cost had apparently spiralled out of its price range. It will remain the official airline partner of both the Maple Leafs and Raptors under an eight-year agreement. Scotiabank is already a partner with the NHL, branding Scotiabank Wednesday Night Hockey and Scotiabank Hockey Day in Canada. Official banking partner of the Leafs, it had previously built into its contract with the team to have a crack at the arena naming rights if Air Canada did not renew. The bank's interest was peaked when it became clear that others also were eager. Scotiabank Arena is not to be confused with Scotiabank Saddledome (Calgary Flames), Scotiabank Centre (QMJHL's Halifax Mooseheads) or Scotiabank Field at Nat Bailey Stadium (Vancouver Canadians, the Northwest League). Not to mention Scotiabank Place, which used to be the name of the Ottawa Senators' arena. The Sens' home is now called the Canadian Tire Centre. Compare that to the home of the Tampa Bay Lightning, which started as the Ice Palace in 1996 before becoming the St. Pete Times Forum, Tampa Bay Times Forum and now the Amalie Arena. Prior to the ACC, the Leafs had called Maple Leaf Gardens home since 1931 — winning 11 Stanley Cups from 1932 to 1967. Expect the Scotiabank logo to replace that of Air Canada atop the Bay Street building as well as under the jumbo scoreboard inside. 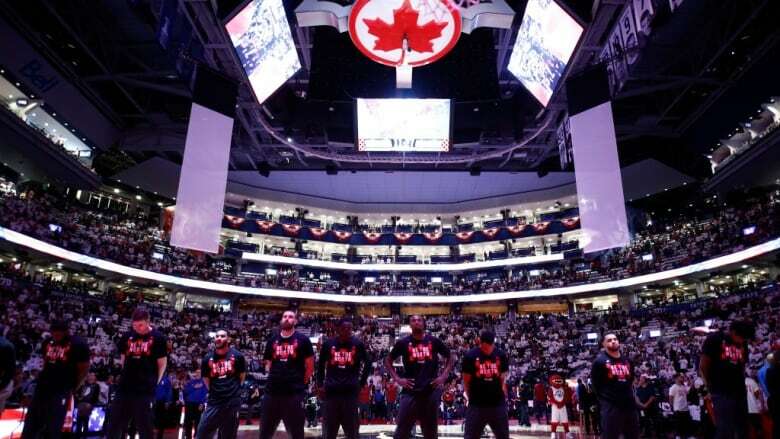 This deal also includes philanthropic opportunities with the MLSE Foundation, and a digital collaboration between MLSE and the Scotiabank Digital Factory. The arena is also home to the Toronto Rock of the National Lacrosse League and a bustling stage for music. "In Canada there is no busier place — and in a very important market for us" said Doig. Toronto FC, also owned by MLSE, flies the flag of rival bank BMO. The Major League Soccer team wears the BMO name on its jersey and plays at BMO Field. "Our relationship with BMO, BMO Field and TFC is unaffected by this announcement," said Hopkinson. Rogers, which owns baseball's Blue Jays, boasts the Rogers Centre (Jays), Rogers Place (Edmonton Oilers) and Rogers Arena (Vancouver Canucks). Those whose heads are spinning with arena name changes can take solace in the fact that they don't live in Naruto, Japan, where the local venue is named Pocari Sweat Stadium after a sports drink. South of the border, Louisville has the KFC Yum! Center in Louisville while Phoenix has the Talking Stick Resort Arena. And raise a glass to English soccer team Witton Albion FC, which used to play at Bargain Booze Stadium, now known as Wincham Park.